What does HBO mean? This page is about the various possible meanings of the acronym, abbreviation, shorthand or slang term: HBO. Home Box Office is an American premium cable and satellite television network that is owned by Time Warner, under the operating subsidiary Home Box Office Inc. HBO's programming consists primarily of theatrically released motion pictures and original television series, along with made-for-cable movies and documentaries, boxing matches and occasional stand-up comedy and concert specials. 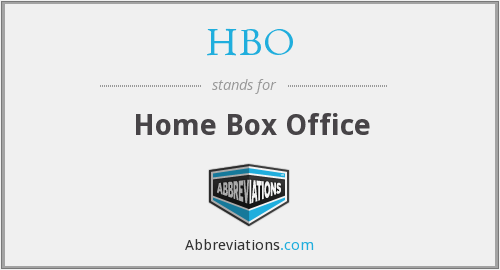 Couldn't find the full form or full meaning of HBO? Know what is HBO? Got another good explanation for HBO? Don't keep it to yourself! "HBO." Abbreviations.com. STANDS4 LLC, 2019. Web. 25 Apr. 2019. <https://www.abbreviations.com/HBO>.